Where are you going, Nilofar? 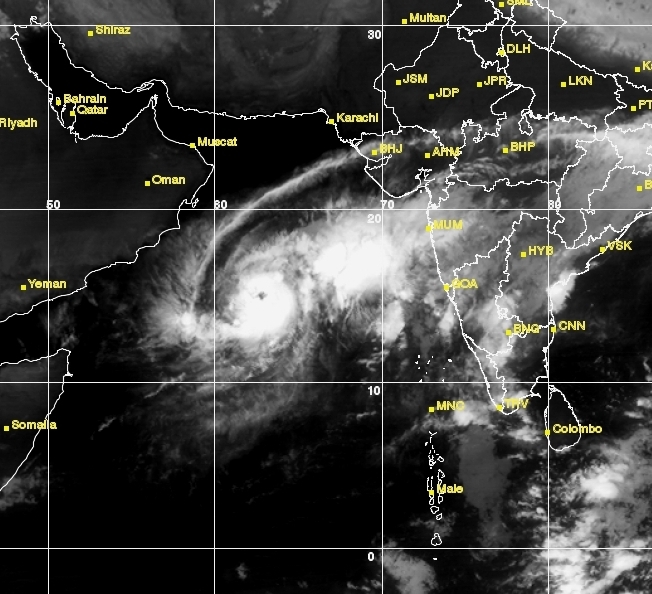 The Kalpana-1 image of 26 October 2014 (2345 UTC) shows Cyclone Nilofar over the Arabian Sea. The graphic shows the cyclone track of the US Navy Joint Typhoon Warning Centre, Hawaii, as of 26 October 2014 (2100 UTC). This is a reminder from nature that not all cyclones are like Phailin or Hudhud. Many cyclones do not follow well-drawn paths that can be predicted 4 days in advance. 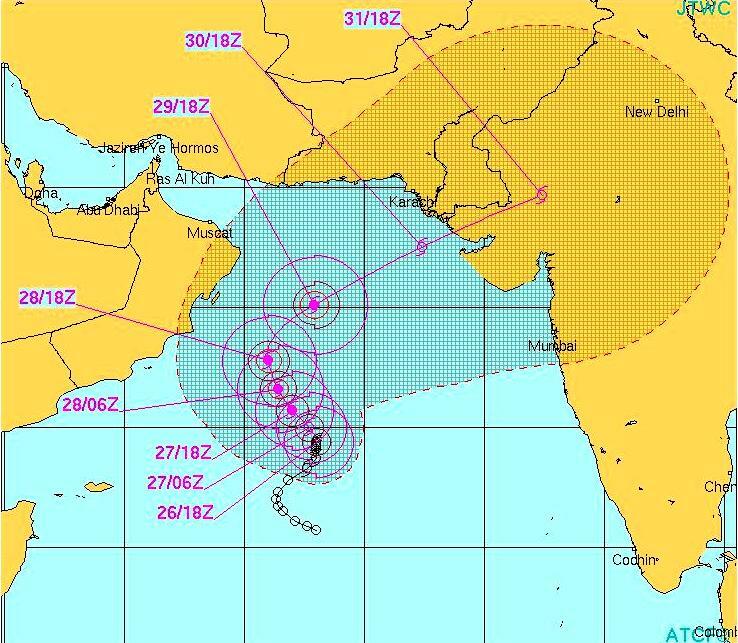 Nilofar’s track shows twists and turns. It has been moving slowly, keeping safe distance from all coasts. No one knows for sure where it would eventually make landfall or whether it may dissipate over the sea itself. In the present situation, whom can you warn and what can be the warning? Nilofar, it seems to me, is deciding its own destiny! 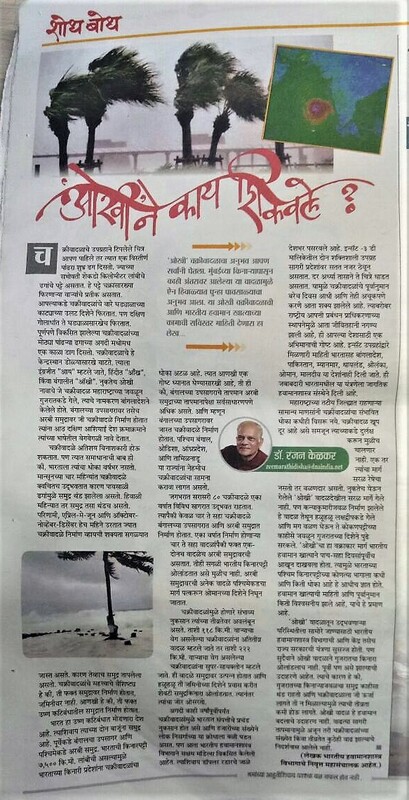 A Marathi article on Cyclone Hudhud was published in the Manthan supplement of the newspaper Lokmat on 19 October 2014. To read the article in pdf format click on the link below. After Phailin, Helen, and Lehar, it is now Madi, the fourth successive cyclone to form in the Bay of Bengal in eight weeks. Cyclone Phailin had a straight line path and the landfall point could be predicted well in advance. There was enough time for a massive evacuation drive to be executed and for TV camera teams to place themselves at Gopalpur to give a live account of the arrival of the storm. Helen was a much weaker storm and it had a shorter track as well. Lehar was another severe cyclonic storm. But it was different from Phailin. It looked as if Lehar was hesitant to strike the coast. Eventually it adopted a self-destructive path, went into cooler seas, and ended in a whimper far away from land. 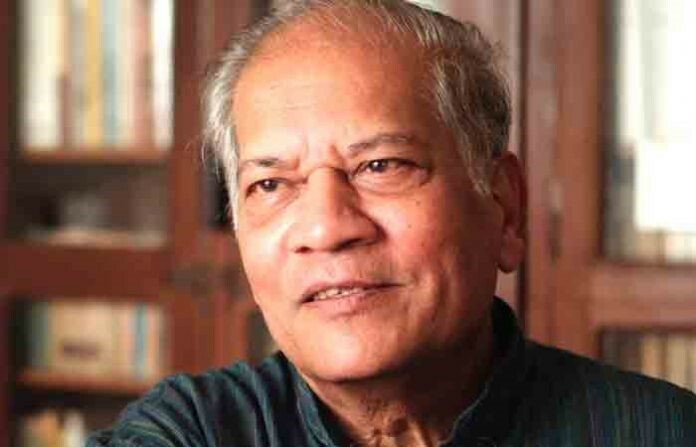 Lehar was like a left-over Diwali phataka (loud cracker) that failed to burst. As I write this post on 8 December 2013, Madi is a cyclonic storm over the Bay of Bengal, and it is currently threatening no one in particular. As a BBC World News weathercaster put it, Madi is aimlessly wandering. Weather prediction models are not able to predict for sure where Madi is heading or what is going to happen to it. It is even said to be in quasi-stationary motion for whatever that means.